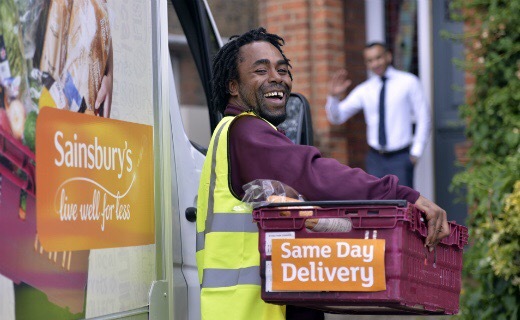 UK supermarket chain Sainsbury’s is planning to introduce same day delivery service at 30 of its stores by Christmas. The firm will initially trial the service at three of its stores, and will significantly expand it to 30 outlets. As part of the trial at the three stores located at Streatham Common, Richmond and Brookwood in Surrey, customers will receive their grocery in four to six hours by ordering before 12pm. However, it is dependent upon whether the customer selects ‘Click & Collect’, or home delivery option. If successful, the same-day online grocery delivery service will be implemented in 30 stores by Christmas. The new service trail is being considered as an effort to compete with its rival Amazon which recently the launch of same-day deliveries in London. Meanwhile, Sainsbury’s announced its plan to launch new online fulfillment centre in Bromley-by-Bow, East London this autumn. Expected to create 900 jobs, the 185,000ft2 centre will cater to the growing demand in the capital for Sainsbury’s online groceries service. Feather added: “Demand for our online delivery service in the capital continues to grow. We expect this trend to continue as more and more customers enjoy the flexibility of multi-channel shopping using our groceries website and app, in addition to visiting stores. Sainsbury’s intends to double the number of Click & Collect Groceries sites to 200 by the end of the next financial year. Posted on July 29, 2016, in #retail, #uk. Bookmark the permalink. Leave a comment.